Be our partner in supporting your community’s youth. Watch our video, featuring Sutter Park staff, teachers and families, as we share why a new playground would be so important to our community, HERE. “Like” our page at www.Facebook.com/SutterParkPossibilityPlayground. Here will you will find shout-outs to our corporate sponsors, fundraising updates, and photos of our committees hard at work. Please feel free to invite your Facebook friends to Like the page, and Share updates with your personal community! The more we share, the quicker our dreams become a reality! Visit our Fundraising site at https://chuffed.org/project/playwithapurpose to make a donation, learn about our initiative, and see our fundraising progress. Please feel free to share the fundraising link with your family, friends and employer! Would you like to make a donation in a special person’s name? 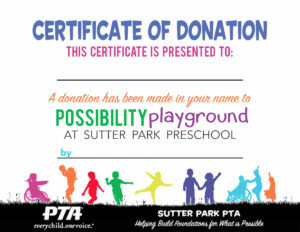 Please feel free to print our FREE PRINTABLE Donation Certificate to present to your favorite Sutter Park teacher, staff, student or loved one. Your donation is welcome and very much appreciated! There are two ways to donate – either online via our fundraising website at https://www.youcaring.com/playwithapurpose, or in the mail. Please Note: Sutter Park PTA is a registered 501(c)3 with a government-issued EIN. We would be happy to provide you with a tax receipt. You can contact us to request a tax receipt by emailing us at treasurer@sutterparkpta.org or play@sutterparkpta.org. If you would like more information about this project or want to help make our playground dreams a reality, contact Committee Chair Abigail Brown at play@sutterparkpta.org.